The son of Irish immigrant John B. O’Brien and Margaret Willis, a native of nearby Braintree, Thomas Joseph O’Brien (known as Buck from an early age) was born in Brockton, Massachusetts, on May 9, 1882. The eldest of eight children (four boys and four girls), he grew up in a modest 2½-story home in the Bush, a working-class, overwhelmingly Irish Catholic neighborhood on the south side of town. Then a small but growing mill city of 27,000, Brockton fancied itself the Shoe Center of the World, and like most of the city’s working-class Irish, Buck’s father earned a livelihood assembling footwear at the benches of the Walkover Shoe Company. At one time or another, all the O’Brien children spent time at the benches at Walkover Shoes, and at least one, Buck’s younger sister, Hannah, spent a lifetime there. As a boy, Tommy O’Brien attended St. Patrick’s, a parish school opened in 1887 by the Sisters of Charity of Nazareth. He was a gifted tenor and athlete, and his life revolved around his passion for theater and sports. Throughout middle and high school, he starred in a series of operas produced at St. Patrick’s, and each Sunday he was a regular soloist with the parish choir. And after fulfilling his obligations at school and church, like many a young man in Brockton, his interest shifted to matters of sport. John O’Brien made it a point to instruct all of his sons in the manly art of self-defense. Fiercely competitive and deeply athletic, Buck took to boxing even more naturally than baseball, and by his teens there wasn’t a young pugilist in town who wasn’t aware of his prowess in the ring. By his 17th birthday, Buck was making a name for himself singing locally and playing ball in the Brockton city league. In the summer of 1899 he held down first base for Brockton’s semipro West Enders, playing in front of wild hometown crowds against clubs in the greater Boston area. Two years later he joined Brockton’s Walkover Shoe factory team. Led by a longtime friend of his, pitcher Billy Reardon, the Walkovers were enormously popular among Brockton baseball rooters, who turned out in droves at the club’s Highland Park grounds. It was during a contest against Holbrook early in 1904 that Buck’s baseball career began to shift from infield to the pitching mound. During an infield play when he made a putout at first, Buck rifled a shot across the diamond and picked off a runner racing for third. That summer began throwing and pitching regularly. A large measure of Buck’s newfound success on the mound was tied to his quick mastery of the trick pitches that, thanks largely to Big Ed Walsh’s success in Chicago, were garnering notoriety across baseball. By its very nature, the spitball was a difficult pitch to control, but Buck quickly developed a knack for it and demonstrated uncanny command. When the Walkovers failed to field a team for ‘07, O’Brien went to work elsewhere. He was hotly pursued by the Portland tam of the Maine State League but, already enjoying steady work as a solo vocalist with Brockton’s Gem Theater, he indicated his desire to stay close to home. When a semipro team in Wakefield, outside Boston, made him a “financially satisfactory” offer that obligated him to play but one game a week, he jumped at it. Buck’s strong work finally caught scouts’ eyes, and at the end of July he was tendered his first professional offer by the hometown Brockton Tigers of the New England League. Led by the legendary Framingham brothers Mike and Marty O’Toole, the Tigers had been dogging Jesse Burkett’s Worcester Busters for most of the summer, and the Brockton Enterprise gushed forth local pride when the team announced that it had signed a “local youngster” to its roster. Buck’s professional debut, on August 20, 1907, against Haverhill (Massachusetts) was well attended, but Buck was an utter wreck. After handing out six runs through the first four innings, he was benched by manager Stephen Flanagan. The Tigers rallied to win 9-7, but at least one local writer chided Buck for woeful control and “mutton” speed. O’Brien fared far better in his second start, nine days later. Facing cellar-dwelling Lawrence, he started the contest poorly, accidentally whipping the ball into the grandstand in the first inning. He settled down and, with solid speed and control, “went through nine innings in swell shape, never once faltering” and walked off the mound with a 6-2 win. Buck made one more appearance that summer, the end of his short-lived career with the New England League. With most of the Tigers lineup returning for 1908, Buck opted to accept another offer to travel to Paterson, New Jersey, to play for the outlaw Union League Intruders. A minor-league city best known for the remarkable baseball feats of its most distinguished alumnus, Honus Wagner, Paterson suffered from gross mismanagement and lax fan interest. Buck fared as poorly as his struggling franchise, limping to a 2-9 mark by late May. On May 21 he bolted from the team, which itself folded three days later. Returning home, he pitched for Taunton, Massachusetts (Old Colony League), and grew stronger and more confident with each start. With the pennant on the line, on September 8th O’Brien won back-to-back complete games against Somerville, and then a 5-0 win over Rockland to help Taunton win the pennant. Buck’s 12 victories that summer caught the eye of a number of big-league scouts, among them Weymouth, Massachusetts, native and Indianapolis Indians catcher Howling Dan Howley. Indianapolis had O’Brien pitch for the Evansville (Indiana) River Rats (Class B Central League) in 1909. He started slowly, but grew stronger as the season progressed, winning eight straight games and 13 of his last 15 to close out the season at 18-11. A month later a “tickled” O’Brien traveled with the Indianapolis team to Cuba for a barnstorming trip across the island. Steady rains caused the postponement of most of the games, but on October 25, Buck took the mound and whipped an aggregation of Cuban ballplayers, 4-2. Two weeks later he was back in Brockton for the winter. Unexpectedly released in February 1910, Buck joined the Connecticut State League Hartford Senators, a powerhouse of a club that had taken the flag the previous year, but as was the case with Evansville a year earlier, his new franchise was a winner turned loser. Hartford took a nose dive out of the gate, eventually finishing the summer in fifth place. And yet again, Buck O’Brien stood out as one of the top hurlers in the league, notching 20 wins (against 10 losses) for the first time in his career. Days later, on August 20, Buck’s contract was scooped up by John I. Taylor and the Boston Red Sox. 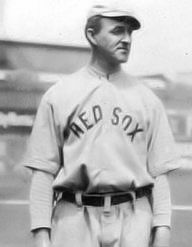 After an active offseason of stage performances in and around Brockton, Buck boarded the Red Sox express bound for 1911 spring training in Redondo Beach, California, and formed the Red Sox Quartet in the course of the cross-country trip. He showed poor form for the Red Sox rookies in a 4-2 exhibition loss to the Lynn Shoemakers on April 15, and was assigned to the Denver Grizzlies of the Class A Western League. When Buck settled in, he began turning out one dazzling performance after the next. On June 5 he pitched and won both ends of a doubleheader against Des Moines (13-3 and 14-1), and facing a pack of St. Joseph’s “hoodlums” three days later, he tied Marty O’Toole’s Western League strikeout record by fanning 18. Buck marked Independence Day by tossing a no-hitter against Lincoln, 5-1 (Lincoln’s lone run coming on an error). By early September, he led the league in strikeouts with 261 (against 77 walks), and his 26-7 record ranked him second in games won, helping lead the Grizzlies to a 111-54 mark and the pennant. Buck’s return to the Red Sox in September could not have come at a better time. Mired at .500 for most of the summer, the Sox had tanked badly, dropping seven straight games and 10 of their last 11. After three days on the rails, O’Brien met up with the team in Philadelphia on September 8. The next morning Boston manager Patsy Donovan approached Buck and asked if he was “ready for a crack at the reigning American League champs.” Buck had not touched a ball in five days, but he offered to loosen up and see how he felt. The day was overcast and a light rain fell at Shibe Park. Buck took the ball, squaring off against Eddie Plank, and, given a 2-0 lead in the first inning, he never looked back. “Buck went about his business as if he were working against some bush league nine,” the Enterprise recorded. There was no faint heart, no falter, no flurry or even indecision.” Philadelphia fans rocked the grandstand with the home team trailing 2-0 in the bottom of the ninth, but Buck coolly struck out Amos Strunk to secure the win and his first big-league victory. Winning five of six games to close out the final four weeks of the summer, Buck established himself as one of the game’s hottest properties. If the accolades Buck drew from baseball circles weren’t enough, there was also his budding stage career with the new Red Sox Quartet. “When he came forward to sing his solo, the crowd that filled the theater burst into applause that lasted several minutes,” the Brockton Enterprise recorded after a performance in Biddeford, Maine. After a brief holdout, Buck signed a $4,200 deal with new Red Sox owner Jimmy McAleer in 1912 and joined his teammates for a song-filled train ride south. Buck nailed a home run over the fence for the rookies to open camp, and despite a series of delays through the rain-filled month of March, he and his teammates slowly ground themselves into shape. Much to the delight of the growing legion of Red Sox rooters, after launching into the regular season with a convincing sweep of the lowly New York Americans, the 1912 Red Sox quickly found a pleasing formula to keep the peace: victory. Buck opened his season in fine fashion, tossing a 5-2 victory over Russ Ford on April 12. On April 20th Buck was far from sharp in the first game the team ever played at brand-new Fenway Park. He yielded three runs in a sloppy opening frame. He labored again in the second, then was tagged twice again in the third, thanks in large measure to his own miscue – a bizarre balk that was called when the saliva-soaked ball accidentally slipped from his hand and rolled helplessly off the mound. Jake Stahl pinch-hit for O’Brien when the pitcher’s spot came up in the fourth; behind Charley “Sea Lion” Hall, the club rallied late to nail down a 7-6 victory in 11 innings. O’Brien’s rough outing in the home opener was followed by subpar performances over the next several weeks and was a major source of concern. It wasn’t until Memorial Day that he finally began to find his groove. He won five of his next six through the end of June, and made several outstanding relief appearances to raise his record to 12-9 by the first week of August. 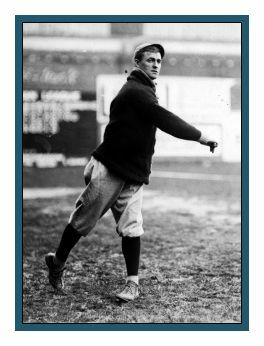 As eyes across baseball grew transfixed on Joe Wood’s staggering 34 victories, O’Brien quietly amassed a series of impressive outings in his own right, notching seven wins in eight starts to bring his record to 20-13 by the end of the season. After seeing the pennant become theirs, the club returned from the road to a massive welcome and parade through the streets of downtown Boston. Hours later, Brockton treated its own hometown hero to a parade of their own. Joe Wood opened the 1912 World Series against the New York Giants in New York’s Polo Grounds with a thrilling Game One victory. Game Two a tie called at dark, and on October 10 Buck took the mound at Fenway Park against Rube Marquard. In another hotly-fought pitchers’ duel, Buck threw well but was nicked for single runs in the second and fifth. Boston fought back in the ninth, but when Hick Cady lined out to deep right field leaving Heinie Wagner stranded at second, Marquard walked off the field with a 2-1 victory. Red Sox victories in the next two games gave them a three games-to-one advantage, and most expected to see a rested Joe Wood on the mound for Boston for a decisive Game Six showdown against Rube Marquard in the Polo Grounds. Under pressure rumored to come from club president McAleer, however, shortly before game time manager Jake Stahl surprised nearly everyone by naming O’Brien as his starter. Perhaps O’Brien was simply not ready to pitch, or perhaps it was just not his day. Whatever the cause, Buck found nothing but trouble when he took the mound against Marquard for a second time. Visibly distracted by John McGraw’s incessant chatter from the third-base coaching box, Buck yielded singles to Larry Doyle and Red Murray, who stood at the corners with two out. He nabbed Josh Devore on a groundout and struck out Fred Snodgrass, but against Fred Merkle he struggled. Intent on checking Murray at first, Buck wheeled away from Merkle toward Stahl, raised his arm to throw, then inexplicably held fire. Buck came completely unglued. By the close of the inning he had yielded five runs, prompting Jake Stahl to pull him in favor of Ray Collins. Boston battled through every frame thereafter and Collins pitched brilliantly, but in the end the five-run deficit proved too much to overcome. Boston bowed once again to Marquard, this time 5-2. For Buck it was a humiliating defeat and a major turning point in his career. It seemed as though Buck disintegrated in front of the fans’ very eyes. Up three games to two, the team glumly steamed back to Boston for Game Seven as the Giants whooped it up in the rear cars. As Buck sat quietly in the Pullman, teammate Joe Wood sauntered by his seat. “Well, you’re a fine joke of a pitcher! Put the game on a platter and handed it to the Giants, didn’t you?” In a flash the two were at each other’s throats, and reports of dissension in the Red Sox camp once again began leaking into the papers. The two were pried apart the next day, with Wood wielding a baseball bat after Buck punched him in the face, but in the decisive eighth game on a cold and gray October 16, Buck looked on from the bench as Boston triumphed behind Hugh Bedient and Joe Wood in a 10-inning 3-2 thriller. The players celebrated wildly, after which Buck quietly packed his gear and headed for home. At the Brockton station at 8:01 that evening, he was met by an estimated 3,000 cheering fans, who roared their approval to welcome him home. He was paraded about town – the crowd far exceeding those who had welcomed Presidents Teddy Roosevelt and William Howard Taft a few years earlier – and landed at the Russell club for the remainder of the evening. At the reception, Buck took the stage to thank his family and all those who had supported him over the years. By the spring of 1913, 30-year-old Buck O’Brien was a ballplayer in his prime, and as his scuffles with Joe Wood during the World Series confirmed, his fighting spirit had diminished not a whisker. To his countless fans back in the Bush, that made all the more bitter the rapid demise of what appeared to be a promising big-league career. O’Brien once again stumbled out of the gate in 1913, but unlike years past, he seemed unable to find his rhythm and control. In all fairness, he was not helped by his slumping teammates, and open warfare between Buck and other members of the team (including owner McAleer) soon exploded. Buck struggled to a 4-9 record through June, and on July 2, over the vehement objections of manager Jake Stahl, McAleer sold him to the Chicago White Sox for $5,000. Over the next three years, O’Brien bounced from one minor-league club to the next. Buck continued to pitch locally for the Brockton Colonials that summer, but when manager Eddie Burke relegated him to the bench in late August, he quit and headed to Syracuse in the New York State League to close the year. He appeared three times, winning his first game before being batted around mercilessly in his final two appearances. It marked the end of his professional career. Long after many of the 1912 Boston Red Sox left baseball for other careers, he continued to pitch and sing. Harnessing the notoriety he gained with the Red Sox Quartet, Buck continued performing his old stage numbers in variety shows for the better part of a decade. In the summer of 1934 the O’Brien family suffered a major setback when Buck fell from the roof of a two-story building into a nest of barbed wire. He suffered massive injuries to his chest, neck, and face and was rushed to the hospital, where he required several bouts of surgery and hundreds of stitches. He remained in intensive care for several weeks. There were doubts that Buck would ever work again and, according to his daughter, he was out of work for nearly two years. But return to work he did, in 1936, taking a job as a custodian with the Charlestown Boys Club. He remained there until the war came to the United States in 1941. Buck did his part, taking a job as a security guard with Lawley’s Ship Building Company on Port Norfolk in the Neponset neighborhood of Boston, proud producer of “mighty midget” amphibious landing craft. When the 59-year-old port closed its doors for good in 1945, Buck returned to his old job at the Charlestown Boys Club, where he remained for the next decade until chronic ulcers sidelined him for good. Never forgetting their old friend, when word spread that 73-year-old Buck was gravely ill at Boston’s Carney Hospital after suffering severe hemorrhages and was in dire need of blood, no fewer than two dozen old friends turned up at the Red Cross donation center in Brockton and ponied up a pint apiece on his behalf. Over the next four years Buck continued to battle a variety of ailments, and on the morning of July 25, 1959, his daughter arrived at his Dorchester home to take him to a scheduled medical appointment. Buck never made it. En route to the doctor’s office, Buck suffered a massive coronary occlusion and died. He was 77. Buck O’Brien was gone, but he would not be forgotten. Three years after his death, he was again honored, this time at Fenway Park, where the surviving Speed Boys returned in April 1962 to mark the 50th anniversary of the championship summer of 1912. In acknowledgement of the first man to throw a pitch at Fenway Park, the honor of throwing out the ceremonial first pitch fell to Buck’s 9-year-old grandson, Tommy O’Brien.